Imagine a peaceful hilltop farm with 20-mile views, hayfields and crops and simple structures all obviously tended with love. Imagine living there in your own private fully-equipped cabin with a deck, shower and place to relax. Imagine what may be the healthiest lifestyle possible on every conceivable level. 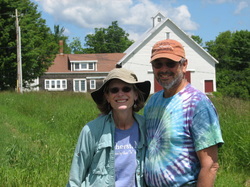 If all that sounds good, then consider living/working/eating/playing/learning/growing/laughing/meditating with Sarah and Pic (Richard) at True North Farms. That is what we have done - twice - for short periods, and will do again and again as long as we can. We begin to feel the effects of TNF during the 3-hour drive from our home and then settle into its gentle but industrious pace - looking forward to rising earlier and working our muscles more than usual. And by the time our stay is over, we feel totally fed (despite our smaller waistlines), with aching cheeks from frequent smiling, replenished and infused with the spirit of life.